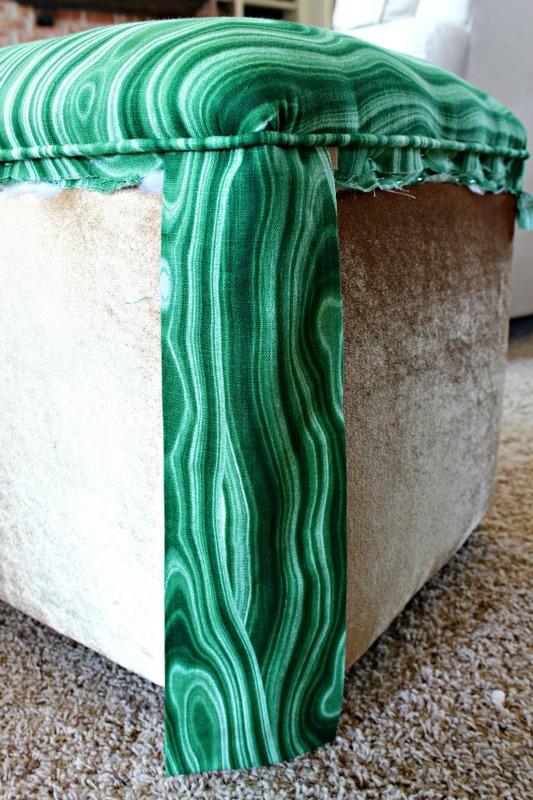 Well, here we are 9 months after I completed my Master Bedroom for the One Room Challenge last Spring, and my DIY upholstered ottomans are one of the projects that I have neglected to share with you. So, since I'm spending January trying to clean out and organize and not doing many blog-worthy projects, I thought this would be a great time to finally share this tutorial with you. I think that this is a project anyone could tackle, it's mainly measuring, ironing, and stapling. 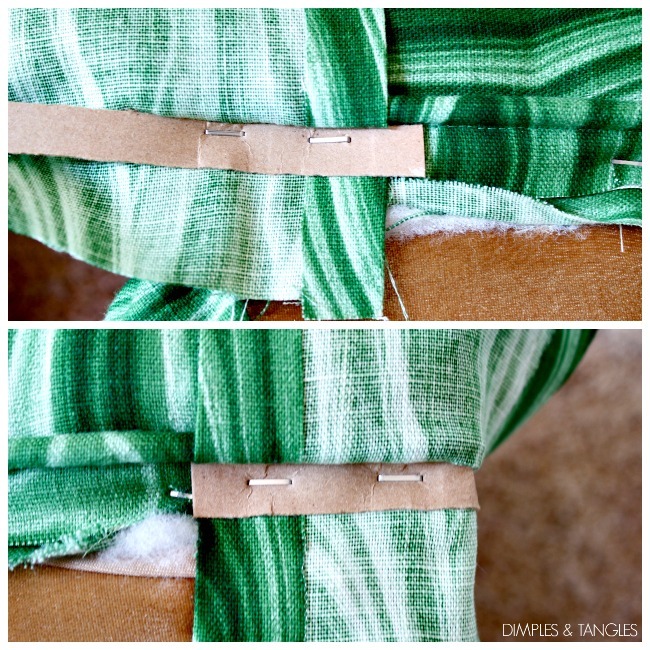 I did a tiny bit of sewing to make the cording around the top edge (which you could do too if you can sew a straight line- here's a great tutorial), but you could even get around that by purchasing ready made cording if you wish. I came across these stools on Craigslist and although dated, loved the shape and size and they were very sturdy. I had been thinking about a set-up like this (Edie's home is a huge inspiration to me! ), and was keeping an eye out for stools that I could use in front of the fireplace that could be easily moved if needed. For the makeover, I started by removing all of the printed fabric. The box underneath was covered in another gold-ish fabric with padding underneath, and I left all of that intact since it would be covered up again. The stools were a bit bulky and hard to maneuver, so I added simple casters to the bottom to make them easier to move. Update in the time since I've done these... apparently the bottom was just particle board or something that's wasn't very strong, because it came apart under a few of the wheels. Since then, I removed the wheels, had a thin piece of pine plywood cut to fit the bottom, screwed it over the existing bottom, then reattached the wheels. Now they have something strong and sturdy to attach to. I wanted to beef up the padded top a little bit, so I used some scraps that I already had. I think there's some foam from an egg crate mattress, some padding from a mattress pad, and a few layers of batting. I cut them a few inches larger than the top so they hung over the sides. Next I layered my fabric on top of the batting. With an idea in mind of where I wanted the cording to go to divide the top from the sides, I stapled all of those layers down along the sides, pulling tightly. It helps to start in the middle of each side, pull the fabric across and do the opposite side next, then repeat with the other two sides, making sure your fabric is straight and taught as you staple. When you reach the corners just pull then down a little more and bunch the fabric slightly as needed to get a smooth finish. After the top was stapled down it was time to add the cording. This was the only part that was necessary for sewing. You could also purchase a pre-made piping or cording to use if you don't want to make your own. I decided where the cording would go and made a template (there's a mark on that paper that lines up with the bottom of the stool- the top lines up where the cording will go) to make it easy to line up around all of the sides. At the time I didn't have my air compressor stapler yet, so I used this electric stapler for this project. It's reasonably priced and does a fine job for lighter upholstery projects. 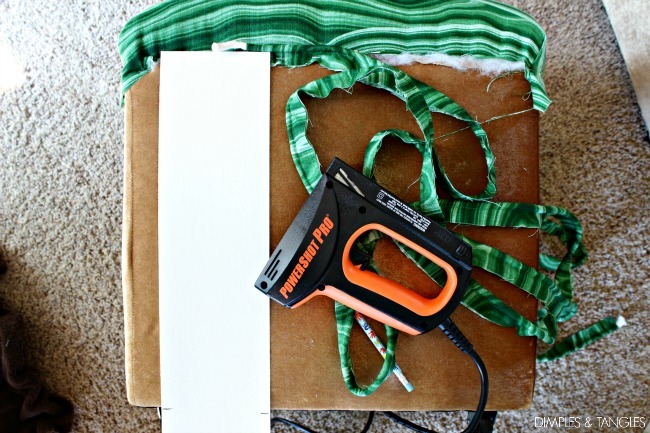 It definitely saves your hand from all of that manual stapling with a regular staple gun. For each stool I cut 4 panels for the corners and 4 panels for the sides. I won't give measurements here because sizes vary, but measure from the bottom of the cording to just where you want the skirt to hit the floor, then add about 2 1/2 inches (allows about an inch for the top and 1 1/2 inch for the bottom hem which I like to turn under twice for a completely finished edge). For the corner pieces, I cut them about 10" wide which allowed for an inch on each side to turn under. 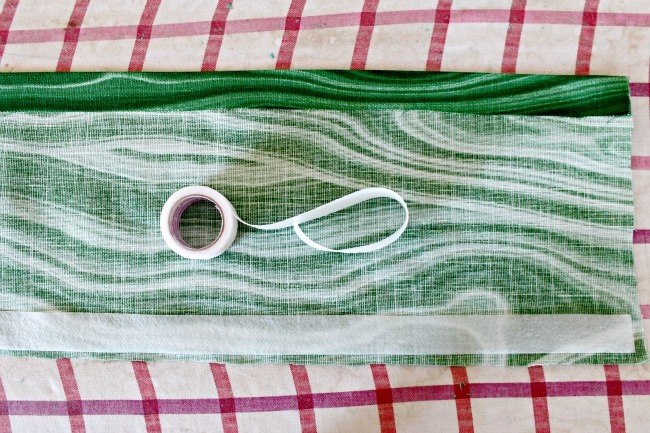 Finish the sides and bottom of each piece by pressing with an iron and then pressing no-sew tape fusible tape under the fold to make it secure. You could definitely sew this if you wanted to, but I wanted a finished look without seeing any stitching, and this is easier and faster! 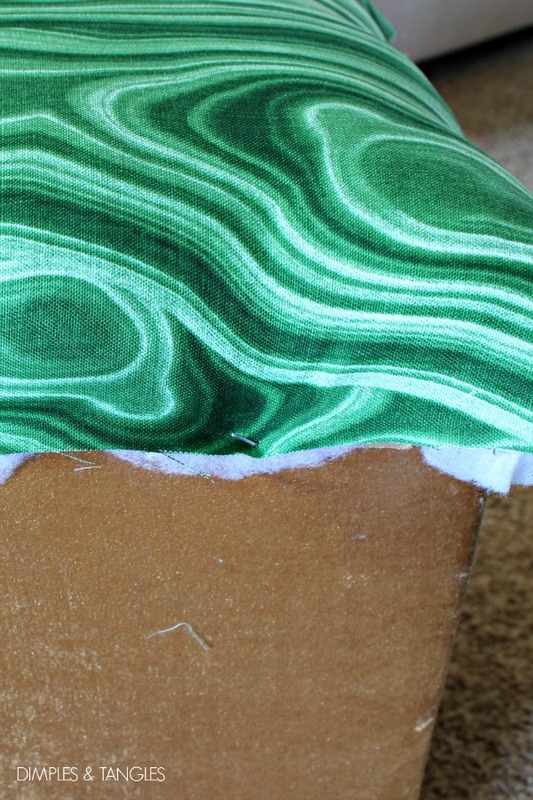 Don't use any fusible tape on the top, only fold it under and press so you'll have a crisp edge there as well. This will be important in the next step. 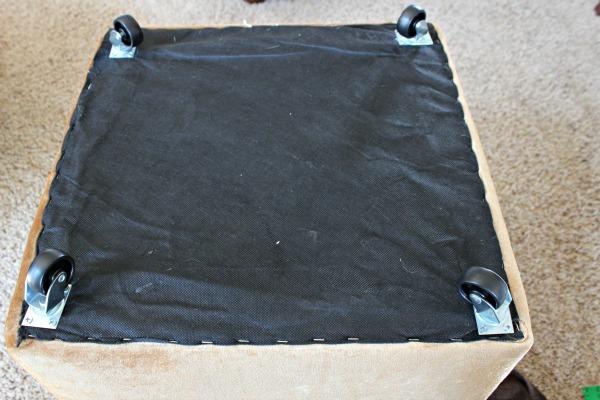 To attach the sides and corners to the stool, you'll want to use a cardboard upholstery tack strip to get a crisp, finished, professional looking edge. Tear a piece off just a little bit longer than the fabric piece you're working with. 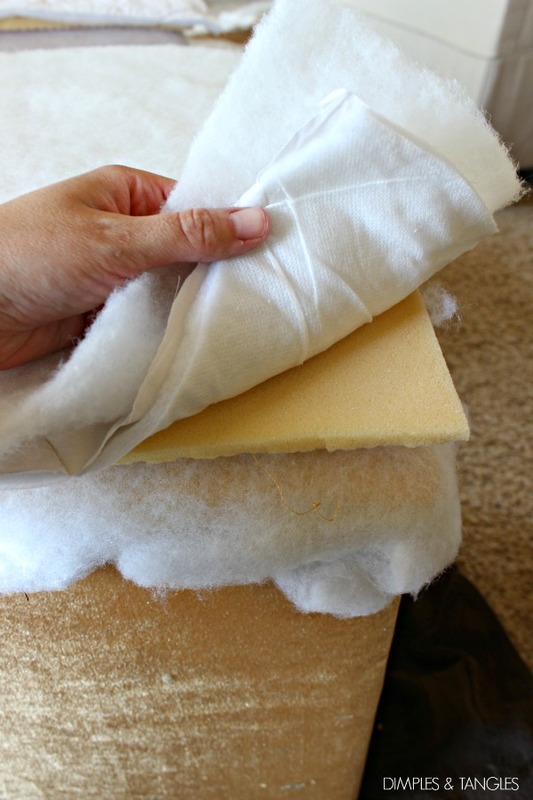 Attach the corners first, because you'll want the full side pieces to be layered on top. Place the corner piece in position where it just touches the floor, then flip it up from the bottom so it's upside down but the top is still in place. 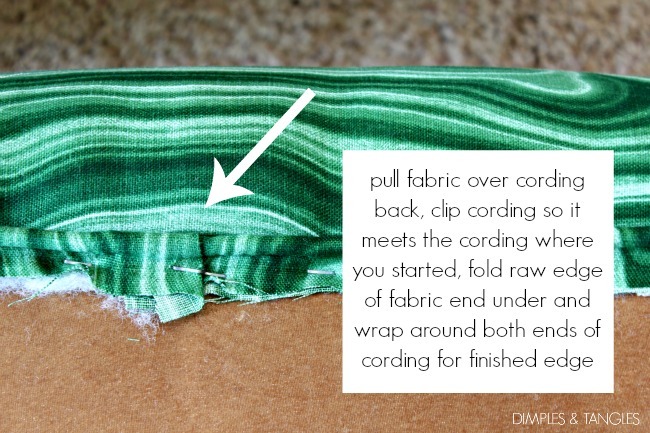 You're going to position the cardboard strip right up in the top fold that you pressed previously, as close as you can get it to the bottom of the cording, and then staple along the top edge, all the way across the piece of fabric you're attaching. 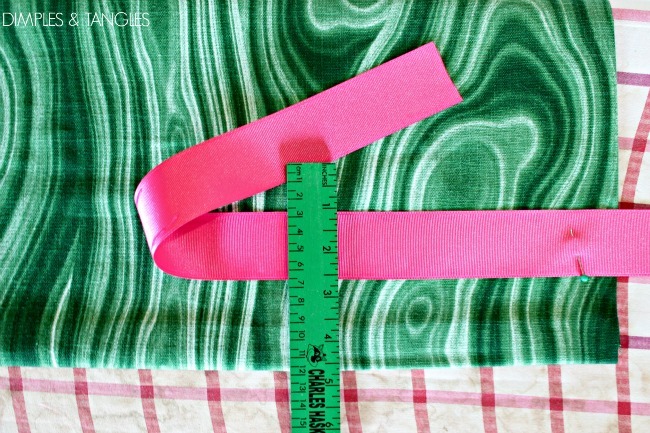 When you flip your fabric piece back down, it should fit nice and tight against the cording. Repeat that process for all of the corners, then all 4 sides on top, making sure everything lines up along the hemline at the bottom. If you are happy with that look, sit back and smile, because you're finished! I wanted to add a bit more detail, though, so I attached some nail head tacks. 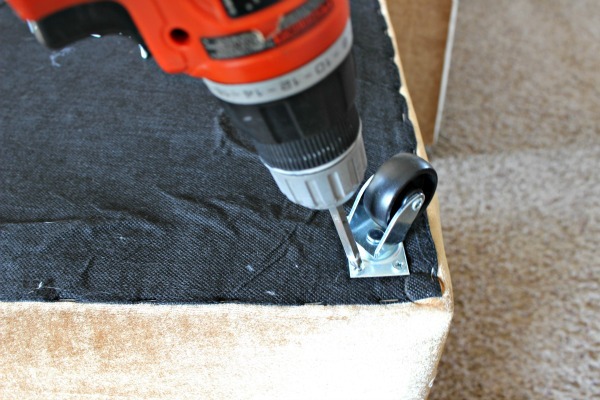 These strips are definitely the fastest and easiest way to add nail head trim, but you could do individual tacks if you're a glutton for punishment you want an even more professional look. and that's how they looked for the reveal of my bedroom. Since then, I've moved them back and forth from my room to the Living Room and decided to remove the pink trim (there was some glue residue left on the fabric which came off easily but gently rubbing with a wet cloth). I can't promise that I won't add another trim someday if I find something I love! By the way, this fabric is by Robert Allen and is called Malakos and here's the best price that I've found for it, just in case you love it as much as I do. ;) It comes in several other colors, too! 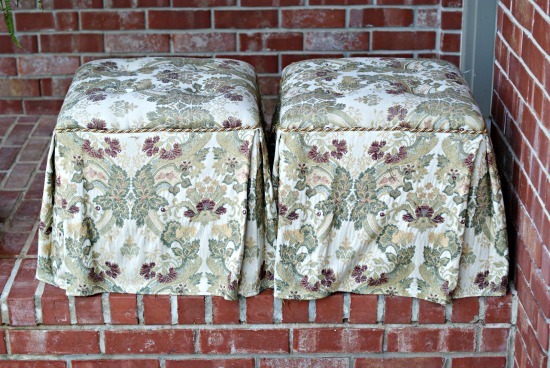 This pair has been one of my best Craigslist purchases, and they were actually pretty simple to re-cover. 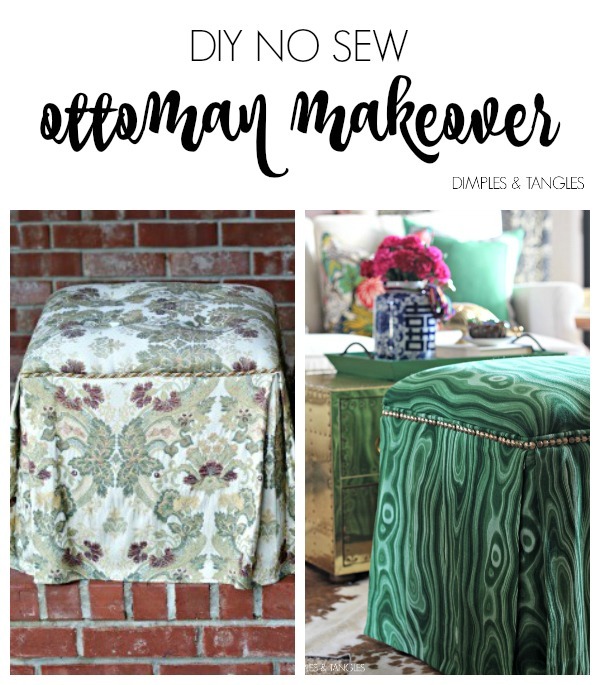 I have a weakness for pairs of ottomans, they're just so versatile! Great tutorial. I love the fabric and how these turned out. They are one of my favorite projects you've done too. Oh I love this! 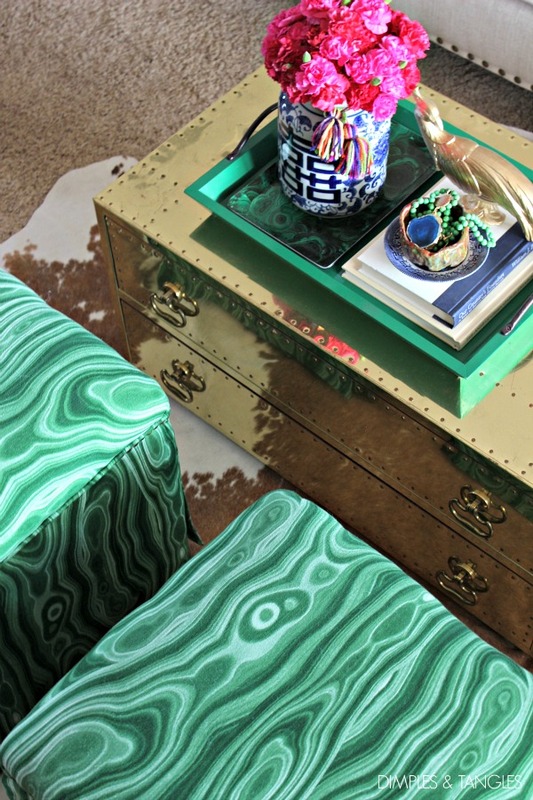 I LOVE faux malachite! 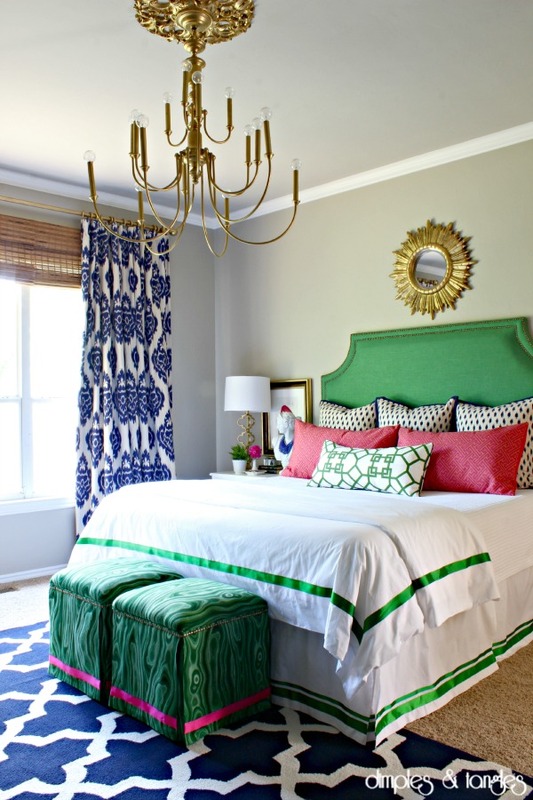 I have dreamed about using that fabric on some curtains in my dining room but the hubs sadly vetoed it. 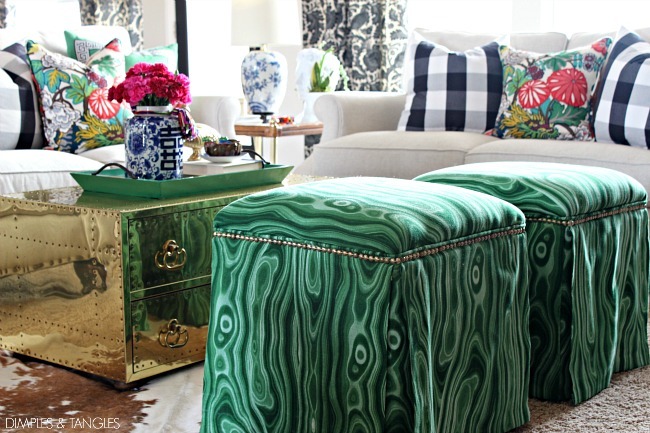 These upholstered ottomans look amazing! 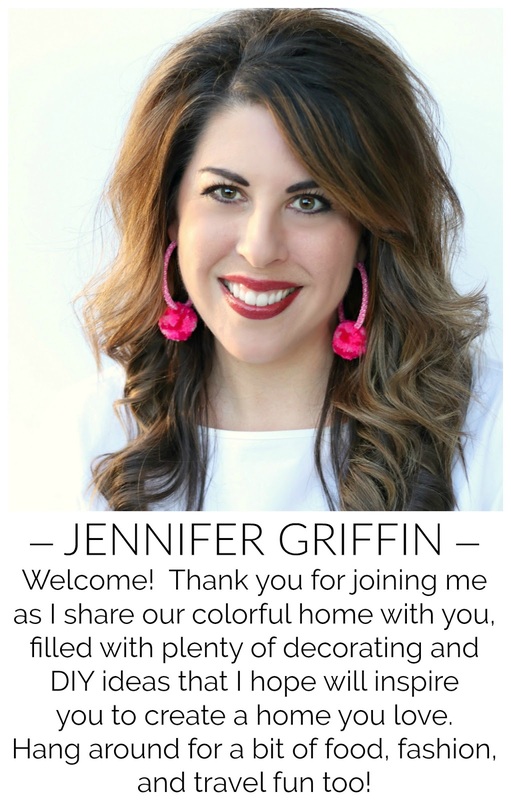 Jennifer this might be one of my favorite DIYs of yours ever! 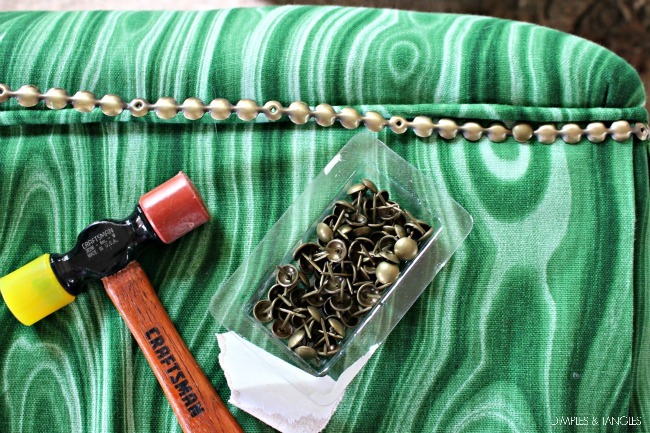 I have always wanted to use that malachite fabric somewhere and I'm swooning over it for this application. The reupholstering came out so professionally, you did an amazing job!! I need to learn how to sew JUST to make cording, it takes projects to the next level for sure! Thank you for sharing and inspiring. Great project! Fantastic! And genius too I might add! Jennifer - Love your custom stools! You do such a fabulous job with explaining each step, which I love. So refreshing that you are not afraid of color too. 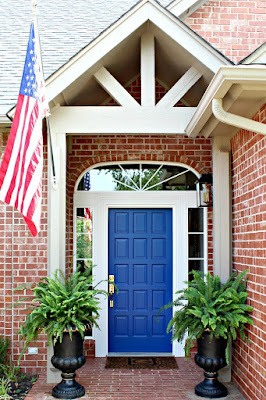 Your blog has always been one of my favorites! Hi Sheryl, thank you so much for that feedback! It's always tricky to try to explain things in writing, and I always hope my tutorials are clear and easy to understand. So happy to have you following along, thanks! 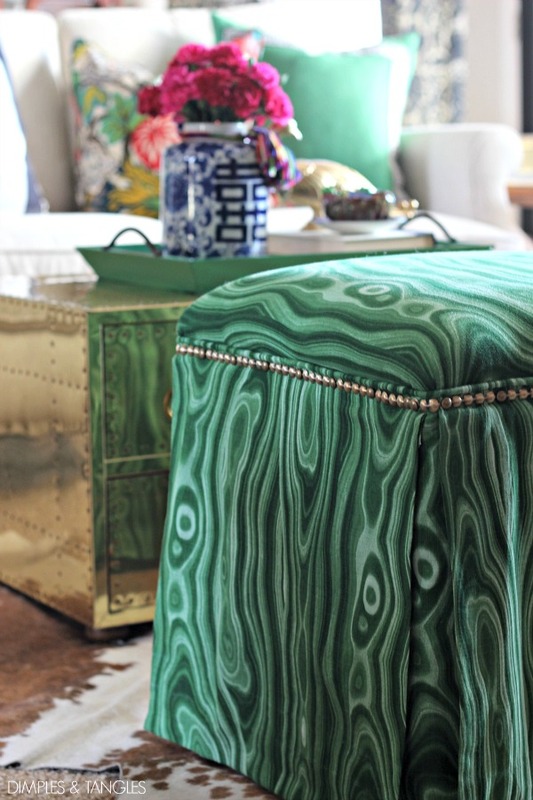 WOW, those ottomans look AMAZING! 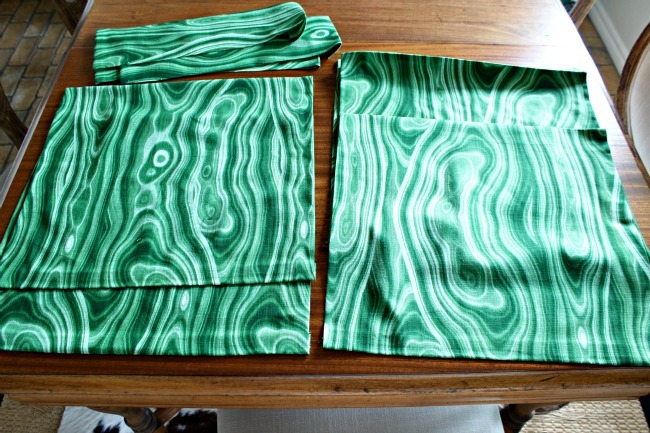 Luuuurve the malachite fabric!